FIGURE 14: GamGFP and RDG quantify DSBs and HJs, map HJ footprints by ChIP-seq in living cells. (A-G) GamGFP foci quantify double-strand breaks (DSBs) in living cells and trap DSB ends causing DNA-repair deficiency. Data from . (A) Strategy for E. coli chromosome cleavage with chromosomally encoded I-SceI ds endonuclease at engineered cut sites (red arrows). (B) Representative images of GamGFP foci without I-SceI cleavage (spontaneous, top row) and after I-SceI cleavage at sites either proximal to the replication origin (left column), or distal to the replication origin (right column). In replicating E. coli cells, there are more copies of the origin-proximal DNA than the origin-distal sequences, and more DSBs generated, and more GamGFP foci, with origin-proximal than -distal cleavage. (C) Numbers of GamGFP foci correspond with expected numbers of I-SceI-generated DSBs. Quantification of GamGFP focus data from multiple experiments diagrammed in parts A and B of this figure. (D) GamGFP recognizes one-ended DSBs generated by replication-fork collapse at an enzymatically-generated single-strand nick, made by the TraI single-strand endonuclease at its recognition sequence in a F' single-copy conjugative plasmid. (E) Quantification of one-ended DSBs generated by replication-fork collapse at the TraI-generated single-strand nick in the F' single-copy conjugative plasmid. F-, no plasmid. ΔtraI, no TraI nuclease. (F) Linear dose response of GamGFP foci with gamma irradiation. With these data and the known number of DSBs per Gray of gamma in E. coli, we estimated the efficiency of GamGFP labeling of DSBs to be about 70% (30% of DSBs are not seen as foci). 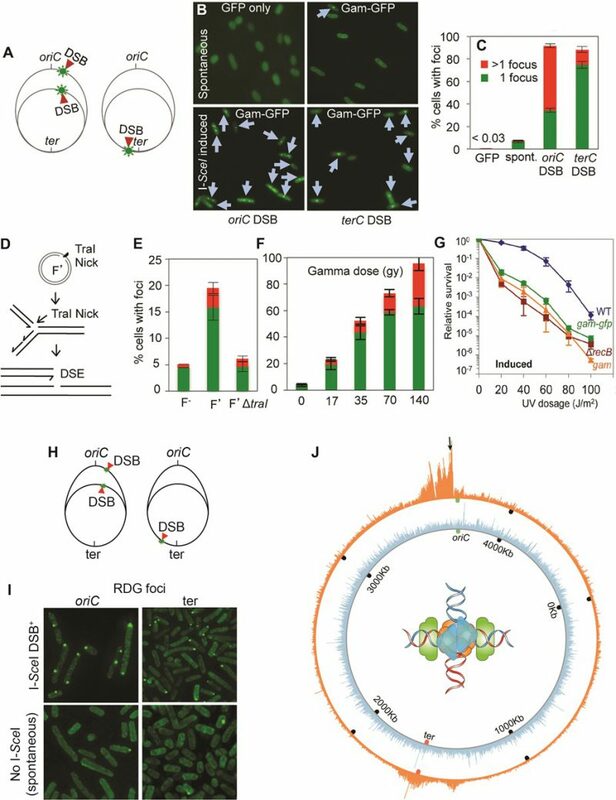 (G) GamGFP production blocks DSB repair, causing a sensitivity to ultraviolet (UV) light similar to that of DNA-repair-defective ΔrecB null-mutant cells. (H-J) RDG foci represent HJs in living cells and RDG ChIP-seq maps HJ footprints. Data from . (H) Strategy for E. coli chromosome cleavage with chromosomally encoded I-Sce I endonuclease at engineered cut sites (red arrows, DSB) (I) Representative images of RDG foci after I-SceI cleavage (top row) or spontaneous foci (bottom row), with cleavage near the replication origin (oriC) or terminus (ter). (J) HJ ChIP-seq at repairing DSBs shows directionality of DSB repair. The orange wheel shows the circular chromosome of E. coli bacteria. The spikes indicate where a molecular intermediate in DNA repair— four-way DNA junctions —accumulate near a reparable DSB in the genome (black downward arrow), and also at and after the replication terminus in the chromosome replication path. Blue, RDG ChIP-seq map of an uncleaved E. coli chromosome showing sites of spontaneous HJs. Center: diagram of HJ bound by RuvC (blue) assisted by E. coli RuvB (green) which stabilizes RuvC on HJs.